Joel Cooper and Tia Eagle are talented young performers. Working together, they form a sensational Trumpet and Piano duo, ‘Brass & Ivories‘, entertaining audiences all over the world. Both highly trained classical musicians, they bring you their own unique take on much-loved music, executed with class and elegance! 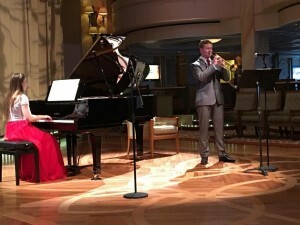 A favourite of Royalty, Brass & Ivories have performed for the Her Majesty the Queen and Duke of Edinburgh, Prince Charles, the Duke and Duchess of Cambridge and Prince Harry. Brass & Ivories thoroughly enjoy performing and engaging with their audiences. Individually, they have been privileged to work with top International ensembles, including the BBC Philharmonic Orchestra, Royal Liverpool Philharmonic Orchestra, Australian National Ballet, and have toured with numerous show companies. They have each released several albums, spanning many musical genres, ( please ask for further details ). Their debut Brass & Ivories Album will be released in Winter 2017.